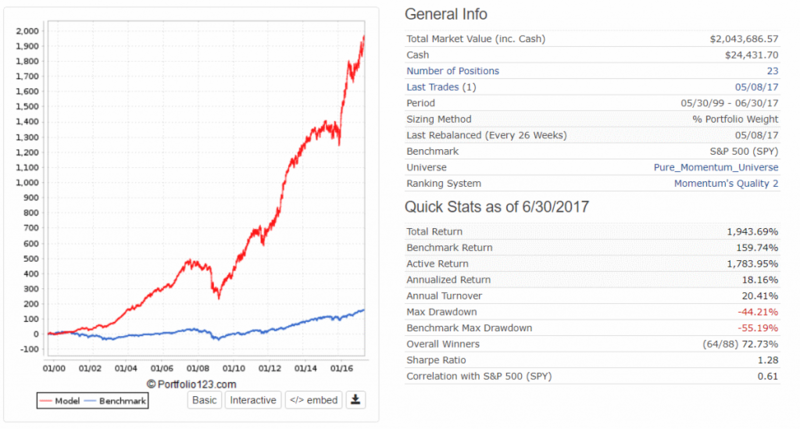 Follow the guidelines below to construct your own Quantitative Momentum portfolio using the Quantitative Momentum Strategy Screener. Decide on the minimum market cap limit for your portfolio holdings. Refer to our guidelines below for the considerations of setting a market cap limit. Adjust the market cap slider accordingly. Decide on the number of stocks you wish to hold in your Momentum portfolio. Refer to our guidelines below for the considerations for the level of diversification. Decide on your rebalance period. Refer to our guidelines below. Buy the stocks with the highest Mom quality Rank. Every rebalance period you will need to replace some of the stocks in your portfolio. Use the guidelines below to determine which stocks should be sold and which should be held. clear all filters and slider settings. Sell the stocks which no longer appear in the Quantitative Momentum screener list. Buy stock to replace the holdings you sold using the buy rules above. The parameters of market cap limits, level of diversification and the rebalance period affect a portfolio’s performance – its returns, its volatility, its max drawdown and its asset turnover. There is no one rule fits all. Investors with differing goals and temperaments will have different choices. The following tables provide a summary of the Quantitative Momentum (QM) model’s performance for various market cap limits and the number of stock holdings. The best results were achieved for an all-cap portfolio with holdings of $200M market cap and up. As expected, small-caps perform better than large caps due to the small-cap factor effect (called in academia SML). Surprisingly, though, an all-cap portfolio containing micro-caps ($30M and up) did not yield better returns. We believe that most individual investors will benefit most from investing in an all-cap portfolio of $200M market cap and up. Only institutional investors with large sums to invest or institutional constraints to adhere to will have to suffice with a mid-and-large-cap portfolio ($2000M and up). The general rule for momentum portfolio is, the shorter the rebalance period, the better the returns. However, short rebalance periods come with higher asset turnover which increases the effort of portfolio maintenance, as well as transaction costs and taxes (for non-tax-deferred accounts). Our testing confirms this general rule. Portfolios with 6 months rebalance period perform better than portfolios with 12 months rebalance period (line 2 performs better than line 1). However, the performance of a portfolio with a 3-month rebalance period (line 3) was not better than that of the 6-month portfolio (line 2). Therefore, we believe that investors are better off choosing a 6-month rebalance-period and no shorter. Note that investors in taxed accounts will not be able to utilize the long-term stock holding tax shelter, yet the high returns of a momentum portfolio are likely to more than compensate for that difference. The higher the number of stock holdings, typically the lower the volatility is (as measured by the standard deviation of stock prices), but also the lower the average annual returns are. Conservative investors who wish to sleep well at night will prefer greater diversification through investing in many stock holdings. Keeping price swings low and reducing the extent of drawdowns will be of primary importance to them, as they are not chasing every marginal percentage of returns. In contrast, aggressive investors seek to maximize their return potential and willing to bear the pain of excess volatility to achieve that goal. These investors will argue that if you diversify too much, you essentially de-worsify your portfolio, as you need to hold stocks that do not have a stellar return potential. Those investors will prefer lower diversification, say with 20 stock holdings. The $ amount one allocates to its portfolio also plays a role. The larger the portfolio is, the more sense it makes to diversify broadly. The more one diversifies, the smaller are the stock position one needs to establish. Smaller positions are easier to initiate and maintain, especially for lower-volume small caps. In contrast, investors with small funds to invest, e.g., $50,000, will prefer reducing the number of positions to minimize transaction fees (which typically have a fixed minimum). For example, such investors will choose to invest in 30 value stocks and 20 momentum stocks, allocating $1000 to each position. Invest in a portfolio of 20 Momentum stocks, with a market cap of $200M and above, rebalancing every 6 months. Most investors will combine a Momentum portfolio with a Value portfolio, such as Quantitative Value, Deep Value or Graham’s Defensive Investor. Combining a Momentum and a value portfolio results in lowering volatility further and increasing risk-adjusted returns. A deeper analysis of the Quantitative Momentum model can be found here.